Prime time is the best time to work out. Then you can fast forward through the commercials while watching your favorite television shows. That's cool Mike! I noted the book in your picture. 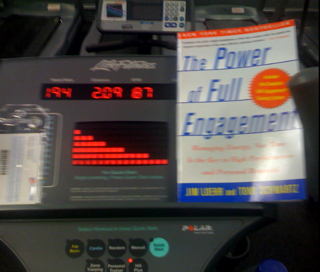 I am at present listening to the unabridged audio book of "The Power of Full Engagement" when I work out myself. Too hard for me to read on the treadmill! Let me know what you think of it when you're done. I'm enjoying it.